The ROI numbers don’t lie. Service virtualization technology is critical to the success of a vibrant application economy. That’s the conclusion from voke, Inc. on their research of 500 companies across the globe. Organizations using service virtualization experience reduced defects and software lifecycles, and increased customer satisfaction. Hear service virtualization should be a cornerstone of testing automation to remove the barrier to releasing software faster and with greater quality. 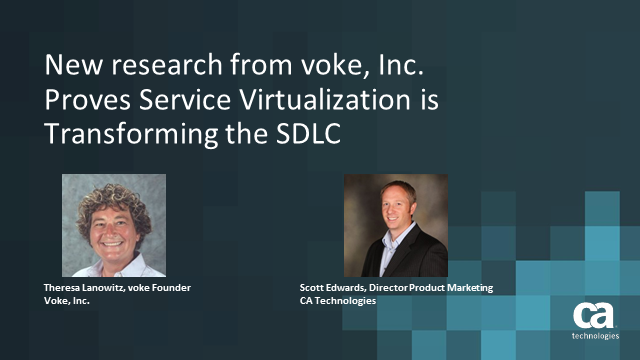 voke, Inc., will review the research showing how service virtualization is an essential technology with a strong and proven ROI used to deliver software that drives optimal business outcomes and removes constraints throughout the software delivery lifecycle.